At what point do supertune’s start getting depressing? 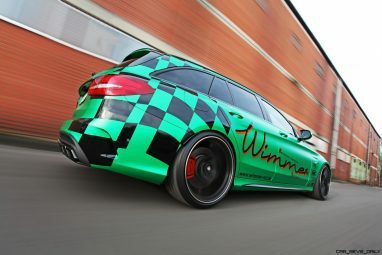 Take this new C63-S Estate by Germany’s Wimmer RennSport Technik. 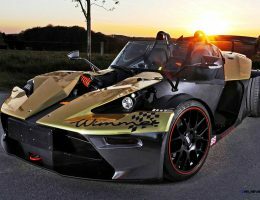 This humble family hauled goes from a monstrous 500HP to a sheerly obscene 790! 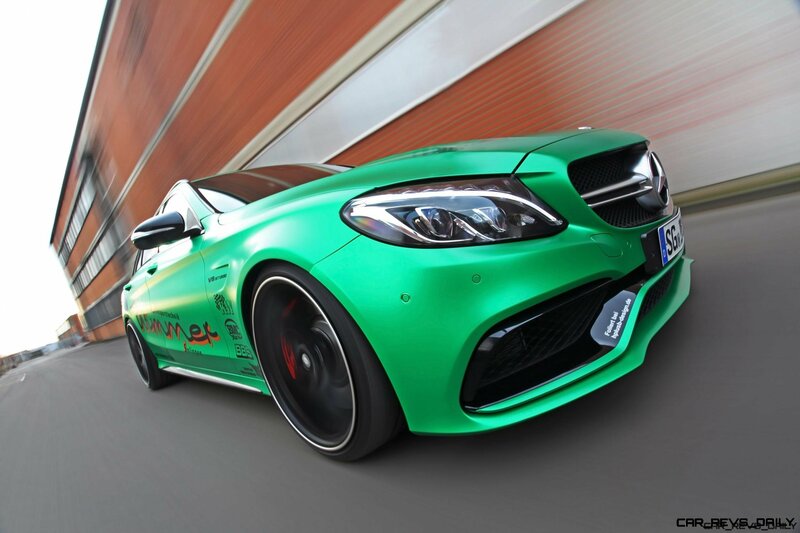 That is adding almost 300 horsepower — more than many performance cars deliver in total! 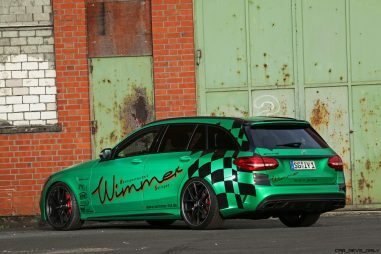 Granted, the full Wimmer RST mod shown here is also priced at 30k Euro — enough to afford a nice WRX Sti if you wanted 300HP (and a whole car) attached. 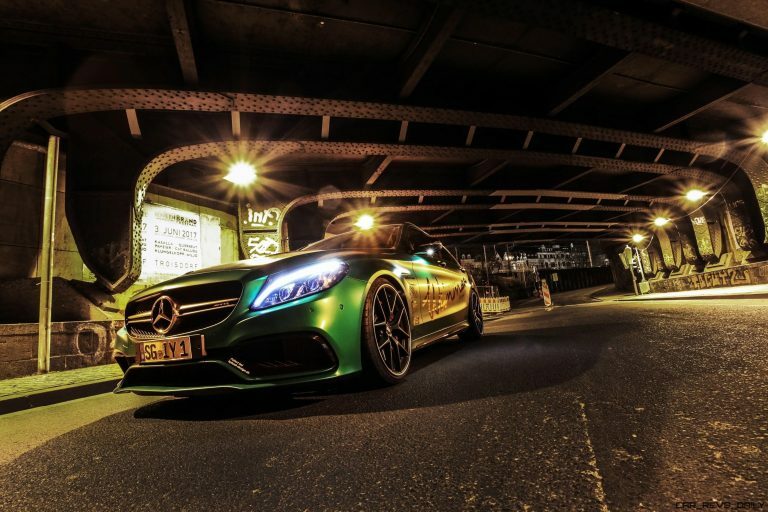 Will any STi deliver G-forces like this killer C63-S longroof? 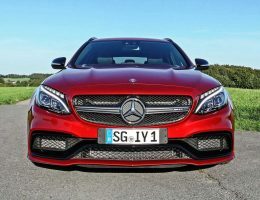 The results of 790HP to the back wheels are predictably shocking. Zinging to redline, surreal boost surge and a bellow from out back like a creature from deep dark Hell. 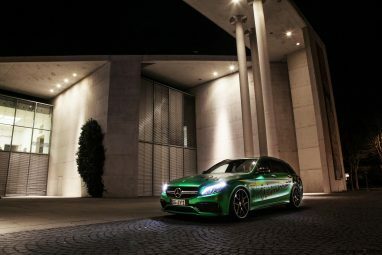 As with all the C63 models, this is all channeled to just the back wheels. 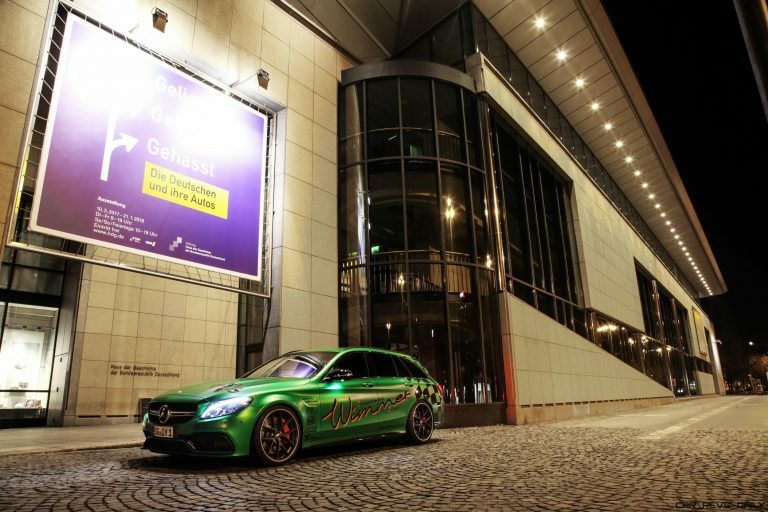 How fast can a wagon drift? 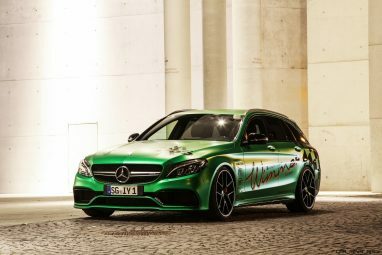 This latest AMG hammer might be able to hold a tail-out slide at the traditional 155MPH speed cap! 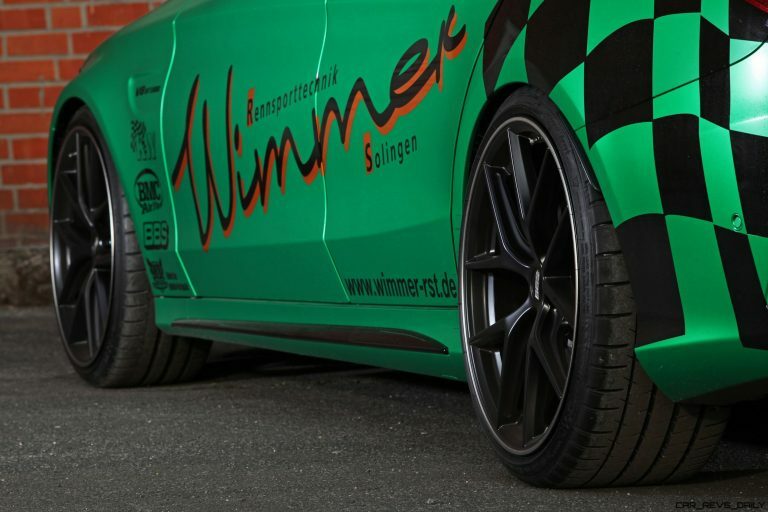 For over 25 years, the main focus of WIMMER Rennsporttechnik in Solingen is the electronic and mechanical performance increase. Whether the optimization is implemented by chip tuning, turbo charger conversion or requires an intervention into the complex compressor technique – it is crucial for the team to carry out the client’s wish, by all means, if it’s technically possible. 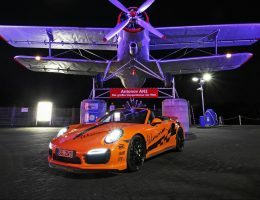 Also exhaust systems, chassis technology, high-performance brakes – and much more – are the daily “bread” of the crew. 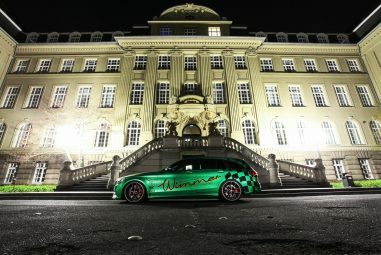 WIMMER Rennsporttechnik proudly presents an power optimized Mercedes-Benz C 63 AMG S with an virtually inexhaustible forward thrust. Well, the regular cubic capacity of 3.982 cm³ remains untouched. 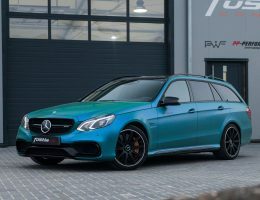 After various alterations, the already mighty engine – original power 375 kW (= 510 PS) and 700 Nm torque – is now operating with 589 kW (= 801 PS) and 900 Nm torque. 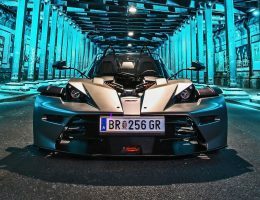 The power/weight ratio has been improved, as well, from 3,25 down to 2,07 kg/PS and will launch the Vmax from 250 up to impressive 320 km/h (limited as per tire speed homologation). 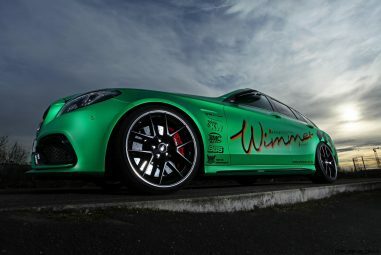 The fulminate performance optimization – called WIMMER RS level V – can be achieved by various steps, as well as an software adjustment. First of all, the turbo charger got an upgrade, followed by the revision of the nozzles, the fuel pump and the inter-cooler. The installation of an additional water pump took place as well. 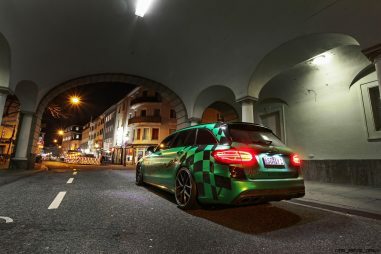 In addition to the handcrafted WIMMER-RS stainless steel exhaust system with throttle system for a fee of 2.990 EUR, a Y-pipe with sports catalysts for 3.500 EUR has been mounted. 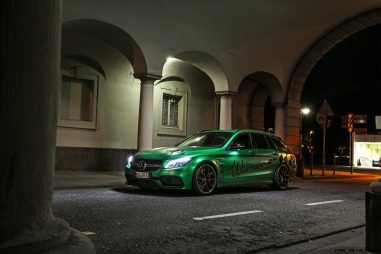 Two BMC high-performance air filters (each 100 EUR), as well as a KW coilover suspension version 3 (2.499 EUR) and the wheel-tire-combination of BBS rims in in 9×20 with 245/30-20 tires on the front axle and 10×20 with 265/20-30 on the rear axle for a fee of 3.300 EUR are worth mention. 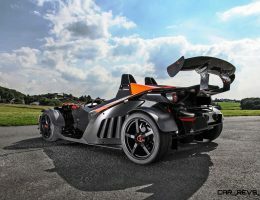 The total fee for this conversion amounts to 29.500 EUR.